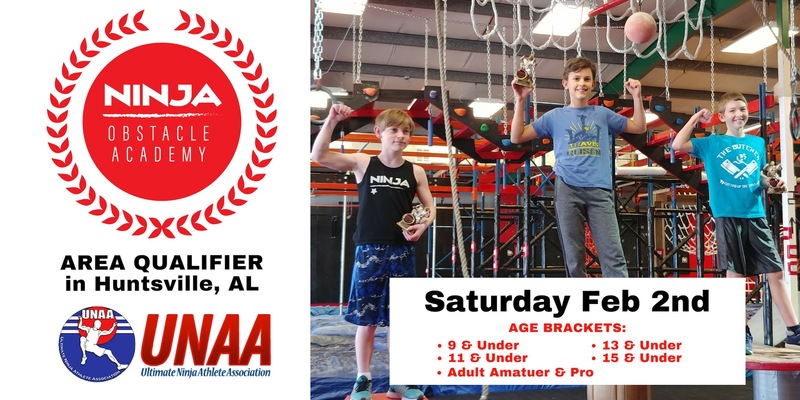 We are so excited to be hosting the Huntsville Ninja Warrior Championship! 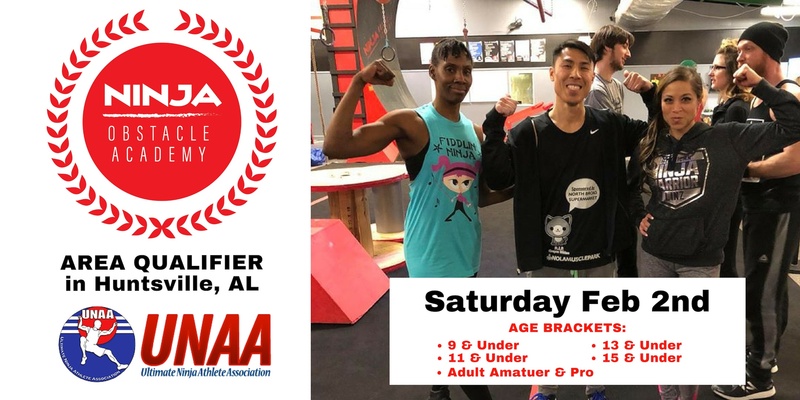 On Friday night we will hold the Academy open from 6-9 pm for the competitors of the competition to practice and get a feel for our obstacle course. Family and friends are welcome to join and a $20 drop in fee will apply for anyone participating that night. Check in time will be at 30-60 minutes before each bracket begins. A complete list of start times are below. Please check in at the check in table right inside the front door. Competitors will be allowed 20-30 minutes to warm up before the competition begins. No one else will be permitted to play on the course. This competition will also act as a UNAA Area Qualifier, but this is not mandatory. This is optional. If you choose for your child to have his/her run count as her/her Your child must be a member of the UNAA to participate in the UNAA, there is an annual membership fee of $25 and you can go here to sign up. The full competition rules can be found here if you'd like to review them. Stage 1 is the UNAA Qualifying run if you choose to particpate. This stage will consist of 7-14 obstacles and the top 50% of competitors will be able to advance to the regional qualifier which will be held on in Spring of 2018 at our Ninja Obstacle Academy. Top 3 competitors at the end of stage 3 will be awarded trophies!